Save The Poudre has been actively addressing the Thornton Pipeline issue for nearly 10 years. Thornton has a huge opportunity to ‘do the right thing’ and run their water down the Poudre River, and take the water out of the River near Windsor to then pipe it down to Thornton — this is a “win win” because the river would get restored and Thornton would still get its water. 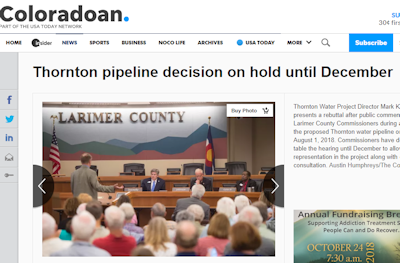 Save The Poudre Director, Gary Wockner, was appointed to the “Working Group” by Larimer County that is currently meeting to come up with a solution to the Thornton Pipeline issue. Throughout that process, as well as over the last year, Save The Poudre has and will continue to advocate for running the water down the Poudre River through Fort Collins.